Your backyard is littered with crude holes. You’ve given up on planting flowers. You’ve stopped entertaining guests outside. And it’s all because your dog cannot resist digging. While you love him, his nasty tendency has driven you crazy. Fortunately, there are ways that you can help him break his habit. Why Is My Dog Digging In the First Place? Different dogs dig for different reasons. In some cases, digging is purely a form of entertainment, and it keeps him from being bored. If you’re prone to garden work, he may think it is okay to “work” in the yard and emulate your behavior. They could also be digging as a means to escape so that they can retrieve something beyond the fence. Sometimes, digging occurs on an instinctual level. Certain types of dogs like herding breeds dig because the need to have a job to do runs deep in their blood. Other breeds like dachshunds or terriers dig because they were bred to do so. Other times, your dog may dig simply as a means to get your attention. In this scenario, it should be noted that he’s not doing this out of spite. Rather, he intends his behavior to be a symbol that he wants to hang out with you more - something that on some level is a bit endearing. What Can You Do to Break This Habit? There is no one universal method that you can deploy to get your dog to stop digging. 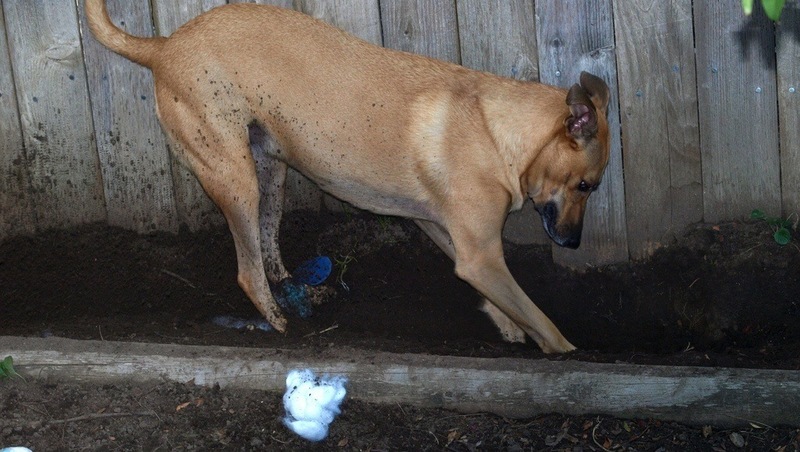 Whatever method you use could depend on the reason your dog is digging the holes in the first place. You may be able to gauge their reason for the hole-digging based on where the holes are being dug and whether or not items have been placed in the hole. Once you have determined the root cause of his digging habit, find ways to either channel his focus elsewhere or remove the root cause altogether. For instance, if you determine that your dog your dog is digging holes out of boredom, give him the opportunity to enjoy outdoor activities so he can burn off energy. If he has developed a tendency to bury bones in the backyard, stop giving him bones. What About a Designated Digging Spot? There is an alternative solution to preventing your dog from digging, and that is to encourage him to dig in a designated area. You can do this by cordoning off a section of your property just for him and his digging habits. You can also achieve this by purchase a sandbox or something similar and train him to do within its boundaries. By going this route, you are allowing your dog to maintain the instinctual habits that might be part of his breed. If you do decide on taking this approach, be sure to accommodate your pooch by providing him with sand, which is much cleaner and softer than soil. Also, be sure to praise him for digging in the right spot - as always, a little positive reinforcement goes a long way. Some camps suggest that hole-digging may warrant some negative reinforcement-style tactics. Some of these tactics may include simple techniques like spraying them with a hose. Other tactics may include more elaborate strategies like burying filled up a balloon in areas where he enjoys digging, with the idea of the balloon popping during his dig may create an association negative enough to stop digging. On the other hand, some camps advocate refraining from punishing the dog. The rationale here traces back to the concept of the dog’s behavior not being one drawn from spite. There is also concern that deploying punishment-based strategies may cause your pooch to grow fearful of you. You know your dog better than anyone, and you should be able to determine what strategy would work best to get your dog to stop digging. Whatever method you do decide to deploy, it should always be executed out of a place of love and general adoration for your pet and never a space that is mean-spirited. After all, your buddy loves you unconditionally; why wouldn’t you honor that love through your actions?